In a newly published study, a team of researchers show that blocking amygdala cells’ interactions with serotonin after trauma may prevent post-traumatic stress disorder. About 8 million Americans suffer from nightmares and flashbacks to a traumatic event. This condition, known as post-traumatic stress disorder (PTSD), is particularly common among soldiers who have been in combat, though it can also be triggered by physical attack or natural disaster. Studies have shown that trauma victims are more likely to develop PTSD if they have previously experienced chronic stress, and a new study from MIT may explain why. The researchers found that animals who underwent chronic stress prior to a traumatic experience engaged a distinctive brain pathway that encodes traumatic memories more strongly than in unstressed animals. Blocking this type of memory formation may offer a new way to prevent PTSD, says Ki Goosens, the senior author of the study, which appears in the journal Biological Psychiatry. “The idea is not to make people amnesic but to reduce the impact of the trauma in the brain by making the traumatic memory more like a ‘normal,’ unintrusive memory,” says Goosens, an assistant professor of neuroscience and investigator in MIT’s McGovern Institute for Brain Research. The paper’s lead author is former MIT postdoc Michael Baratta. Goosens’ lab has sought for several years to find out why chronic stress is so strongly linked with PTSD. “It’s a very potent risk factor, so it must have a profound change on the underlying biology of the brain,” she says. To investigate this, the researchers focused on the amygdala, an almond-sized brain structure whose functions include encoding fearful memories. They found that in animals that developed PTSD symptoms following chronic stress and a traumatic event, serotonin promotes the process of memory consolidation. When the researchers blocked amygdala cells’ interactions with serotonin after trauma, the stressed animals did not develop PTSD symptoms. Blocking serotonin in unstressed animals after trauma had no effect. Memory consolidation is the process by which short-term memories are converted into long-term memories and stored in the brain. Some memories are consolidated more strongly than others. For example, “flashbulb” memories, formed in response to a highly emotional experience, are usually much more vivid and easier to recall than typical memories. Goosens and colleagues further discovered that chronic stress causes cells in the amygdala to express many more 5-HT2C receptors, which bind to serotonin. Then, when a traumatic experience occurs, this heightened sensitivity to serotonin causes the memory to be encoded more strongly, which Goosens believes contributes to the strong flashbacks that often occur in patients with PTSD. “It’s strengthening the consolidation process so the memory that’s generated from a traumatic or fearful event is stronger than it would be if you don’t have this serotonergic consolidation engaged,” Baratta says. “This study is a very nice dissection of the mechanism by which chronic stress seems to activate new pathways not seen in unstressed animals,” says Mireya Nadal-Vicens, medical director of the Center for Anxiety and Traumatic Stress Disorders at Massachusetts General Hospital, who was not part of the research team. This memory consolidation process can take hours to days to complete, but once a memory is consolidated, it is very difficult to erase. However, the findings suggest that it may be possible to either prevent traumatic memories from forming so strongly in the first place, or to weaken them after consolidation, using drugs that interfere with serotonin. The Food and Drug Administration has already approved a drug called agomelatine that blocks this type of serotonin receptor and is used as an antidepressant. Such a drug might also be useful to treat patients who already suffer from PTSD. These patients’ traumatic memories are already consolidated, but some research has shown that when memories are recalled, there is a window of time during which they can be altered and reconsolidated. It may be possible to weaken these memories by using serotonin-blocking drugs to interfere with the reconsolidation process, says Goosens, who plans to begin testing that possibility in animals. The findings also suggest that the antidepressant Prozac and other selective serotonin reuptake inhibitors (SSRIs), which are commonly given to PTSD patients, likely do not help and may actually worsen their symptoms. 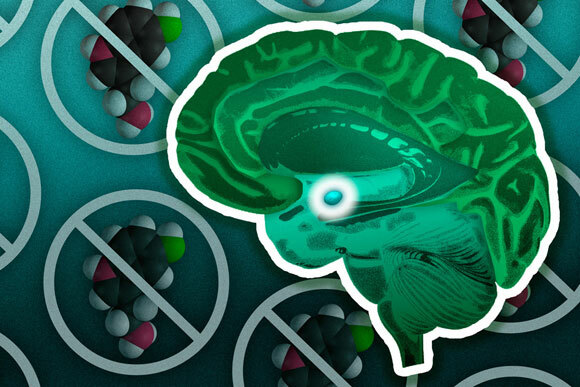 Prozac enhances the effects of serotonin by prolonging its exposure to brain cells. While this often helps those suffering from depression, “There’s no biological evidence to support the use of SSRIs for PTSD,” Goosens says. 2 Comments on "Newly Identified Memory Pathway Could Prevent PTSD"
Confused as to PTSD/TBI damage. Recent discoveries indicate there is neuronal shortening heretofore not seen due to the MRI being weak. New interpretative methods present a stronger picture and show neuronal shortening or absence allowing diagnosis of TBI where before no evidence was available. This line of research would verify damage over just memory. One of the molecules isolated by the late Dr Shura in TIHKAL does the same and a case example is reviewed at some length in the book. To the best of my recollection, the case involved a lad who had been crushed in a roof collapse as a result of his father’s negligence. The family had agreed to conceal the facts and the boy himself had forgotten them except that every time he was in a similarly trapped position (usually it was using a seat belt on a plane) he experienced anxiety to the extent he could not fly. He was then treated with one of Shura’s molecules, recovered his memory of the causitive event, analysed and rationalised it and had no more trouble.